Last fall, when I was trying to come up with a Halloween quilling project, I was stumped. After some time sketching all I could think of was a quilled bat. Unfortunately, this year, I had to put my thinking cap on again for a bit. But eventually, I thought of a project that even the most beginner quiller can handle. This week, I present a quick tutorial on how to make quilling paper witches hats. 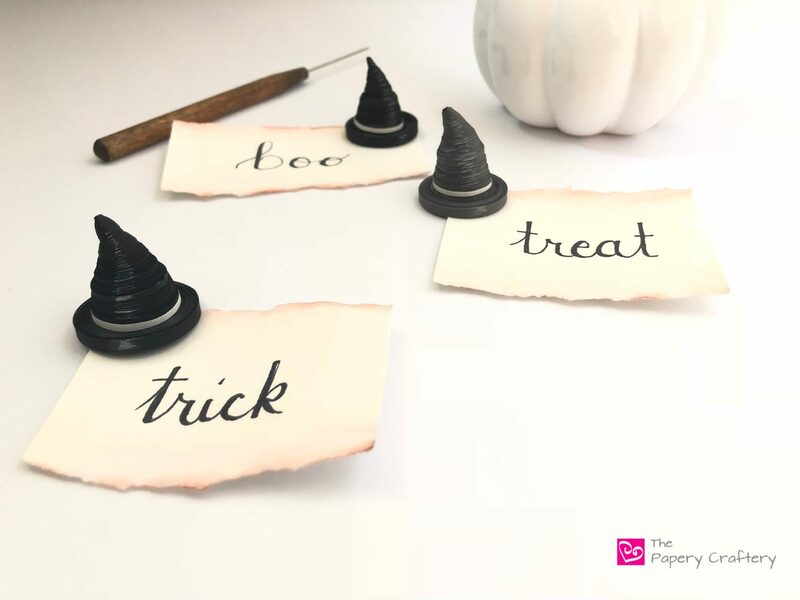 These little hats can be whipped up in no time … plus, I thought we could all use a simpler project after last weeks paper pumpkin. Choose any paper you’d like for your hats. The obvious choice would be black, but I also like these in dark gray. Purple or navy could be fun too! To make the top portion, roll large tight coil. In the examples shown, I used 4 24″ strips of black, glued end to end and my hats ended up about an inch tall. This is one of those projects where an automatic quilling tool might come in handy. Read this review to see if this is a tool you need! You will need a larger coil for the brim of the hat. You could make a traditional tight coil using more strips, or you could wrap your paper around a dowel or other round tool to keep the center open as I did. Just make sure the opening is smaller than the bottom of your first coil, or your hat will fall apart. Once your coil is made, push center out with fingers and other tools. Since you’re going to push this coil past the point of just a rounded mound, I found it helpful to add a bit of glue on the inside and brush it about halfway up. Then, once that’s dry, you can push the rest of the center up without the fear of messing up the bottom. Use tweezers to pull out the center of the hat very slowly. I like the look of the witches hat with a little bend on the end. You can use your tweezers to gently pull the end towards the side, too. Apply glue to the rest of the inside with a brush to keep the tip in place. Use a thin line of glue to attach the hat to the brim. A quilling paper hat needs a quilling paper band! You can use a small pair of scissors and cut a bit of ivory paper in half. Glue this around the base of the hat, where it meets the brim. For a bit of dimension, I added a highlight with a white charcoal pencil. It’s just a little extra touch to make the black paper pop. I love how they look a little rumpled and less than perfect like they’ve been worn for years. Maybe use these hats for a party and add some aged paper name tags or Halloween signs. I used watercolors on the edges of these strips of paper to make them look older, but I’ve had great results with tea or coffee staining, too. I have grand ideas to teach myself how to do some of the fancy writing you see all over the internet, but for now, I follow these instructions on how to fake it. I hope you’ll find a use for these quilling paper witches hats. Don’t be afraid to make some that are larger, too! If anyone makes some big ones, let me know. I’d love to hear how it came out!